"The Isles of the Immortals. The Lands of Youth. A beautiful and unchanging country where elves could seek respite from the toils and troubles of this world. I still remember all the stories about Narevoreen from my youth, when I wondered what it would be like to approach these white shores, and behind them a fair green country lit by sunlight. But time stands still for no man - and as it turns out, for no elf, either. Now that these islands are open to humans it seems that the elves are in a hurry to catch up with all those centuries whose passage they have ignored so far. Every day brings new changes. If you want to see the land of your youthful dreams, I suggest that you hurry - for soon, I fear, it will be gone forever…"
For more than two milleniums, the island kingdom of Narevoreen has lived in splendid isolation. The elves achieved an advanced and stable civilization while most humans still lived in primitive tribes, and thanks to their stable population never felt the urge to expand. Powerful magics and a large fleet protected its borders and turned away all outsiders. Any humans who washed ashore were put to death. It seemed to the inhabitants of the islands that this life would continue indefinitely. They were wrong. The only elves who regularly interacted with the outside world were the members the Royal Navy. They were tasked with the defense of the islands, but individual captains often sailed to other locations to trade, explore, and sometimes raid them. The Navy High Command turned a blind eye to these activities as long as there was no immediate threat to the islands and figured that this was good training. However, in recent decades the activities of elven pirates along the western coast of the continent started to seriously disrupt sea trade between the human port cities. Finally, the human cities had enough. Five years ago, a coalition of port cities assembled a vast fleet of the most modern human ships, staffed with expert sailors and the most experienced battle mages the cities had to offer and sailed towards Narevoreen to put an end to the elven pirates once and for all. The elven Navy met them head on, confident in their superiority. To their shock, the humans won, and most of the Navy, the pride of Narevoreen, sank to the ocean floor. The human fleet sent representatives who demanded that Narevoreen should (a) stop supporting pirates, (b) pay compensation for the damage caused by elven pirates, and (c) open up one of their coastal cities to trade with the human cities. Refusal of these demands would cause the human fleets to continue to lay siege to the islands. The representatives of Queen Meeral hastily agreed. Any elven captains that didn't stop to stoop to piracy were declared renegades (though some elements in the nation continue to give them covert support). The compensation was easily paid - the treasures accumulated over the centuries were much vaster than the humans had even dreamt of. And the city of Navar was opened up to welcome foreign traders. Many members of the Elven Court now realized that the nation had to modernize - and fast, before the human cities became even more powerful and turn Narevoreen into a mere colony. So they set out to turn elven society upside down. The brightest young elves were sent abroad to human cities to study their ways and learn their advanced technologies - both magical and otherwise. Human-style commerce gradually supplanted the old informal barter system. The first railroads were built and nexus towers were erected. Some mages even started to experiment with fertility magics to offset the traditionally low elven birth rate. And one year ago, to the surprise of the humans, the nation opened up to outsiders completely, and now foreigners can receive permits to stay in the islands for up to three months (longer in special cases) without any hindrances. While the progressive elements have the ear of the Queen for the moment, many traditionalists vehemently oppose this movement, and have been exiled to small, distant islands for the most part, where they plot in secret to purify the nations of all outside influence. Their elven patience is sorely taxed by the rapid changes moving through their society, and some grow increasingly desperate and will resort to violence soon. If they knew that members of the Court are currently secretly negotiating for a political marriage between the Queen and the Doge of Atalus, the ruler of the largest and most powerful human city of all, they might try to start an all-out civil war. Most elven realms have an abundance of portals to the plane of Faerie. However, in Narevoreen the material plane and Faerie are melding seamlessly into each other, and the closer you get away from the shores, the further you go down into Faerie in a way that you cannot tell where one plane ends and the other begins. Thus, Narevoreen is both an archipelago in the material plane and a small island continent in Faerie. 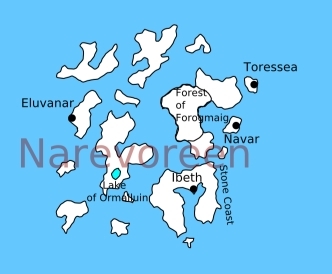 The legends of the elves of Narevoreen state that they did not always live on these islands - instead they fled there approximately four thousand years ago from a "Great Darkness in the East" and decided to make their new home here, soon falling into the feudal patterns that lasted to this day. The most significant episode in the early history of the realm occurred thirty-six centuries ago when Falimar, an elder of the clan of the Neidar and possibly the greatest smith of the elven people, fashioned the seven Tingmaril, or Star Jewels, which captured the light of the stars themselves and were credited with many miraculous properties. Unfortunately, an elder devil stole the jewels and fled to the East. The entire clan of the Neidar was ready to return to the East in order to find and retrieve the jewels, but the queen of Narevoreen forbade it, claiming that their loss would critically weaken the defenses of the realm. In reality, a court seer had foreseen that a great calamity would occur if the Tingmaril were returned to the realm, but the queen considered her explanation to be more believable, and the Neidar grudgingly stayed home. The Old Story: A young visiting noble from Atalus and an elven girl have fallen in love. Now they need to flee from the islands to escape the girl's family, which wants to kill them both to erase the shame. Perhaps the PCs can be of assistance - if not from the goodness of their hearts, then for the reward the noble offers them once they safely arrive in Atalus. But what if the family of the noble is none too happy about this affair, either - and seeks to kill the girl as well?